Scotch whisky has a very small repertoire when it comes to mixing cocktails; only a handful have achieved fame, and even fewer popularity—Blood and Sand, Rob Roy, Rusty Nail, perhaps the Mamie Taylor. There’s a reason for this, of course—malt, peat, and smoke are assertive flavors, and you have to favor them just to get into the game; even if you like Scotch, there is no guarantee that mixing it with other stuff will provide an acceptable result. Dubonnet Rouge is much easier to mix—it’s an aperitif wine along the lines of sweet vermouth—but it doesn’t seem to have caught the imagination of the American consumer. It is almost never stocked in home bars, and is only an occasional visitor even in good public taverns. The only Dubonnet classic cocktail of note is the rarely encountered Opera; there is also the even-less-encountered Dubonnet Cocktail. Though it can be used successfully for everything from highballs to Negronis, Dubonnet just doesn’t get on the radar very often. So it was with some circumspection that I tried Arnaud’s Special Cocktail, from Ted Haigh’s Vintage Spirits and Forgotten Cocktails . Arnaud’s Special combines these two wallflowers to make a delightful combination, the best Scotch cocktail I’ve encountered. This was the house cocktail at Arnaud’s Restaurant in New Orleans in the years after World War 2. According to Haigh, it has been superceded and has fallen into obscurity. The “obscurity” part is too bad, because this is a delicious drink and a valuable contribution to the Scotch cocktail canon. Stir with ice until very cold. Strain into chilled cocktail glass. Express and garnish with orange twist. As for which Scotch to use, start with your favorite, but don’t stop there—play the field. Your whisky choice will dramatically affect this drink’s personality. Haigh suggests that Arnaud’s Special is not a cocktail for non-Scotch drinkers. (In fact, he calls it “an alternative universe Rob Roy.”) His meaning, I think, is that with some Scotches the component flavors do not blend. The aggressive attributes of the whisky dominate the drink, and each of the ingredients remains quite distinct. It’s an interesting flavor profile, and it works, in a strange sort of way. But you better like your Scotch. 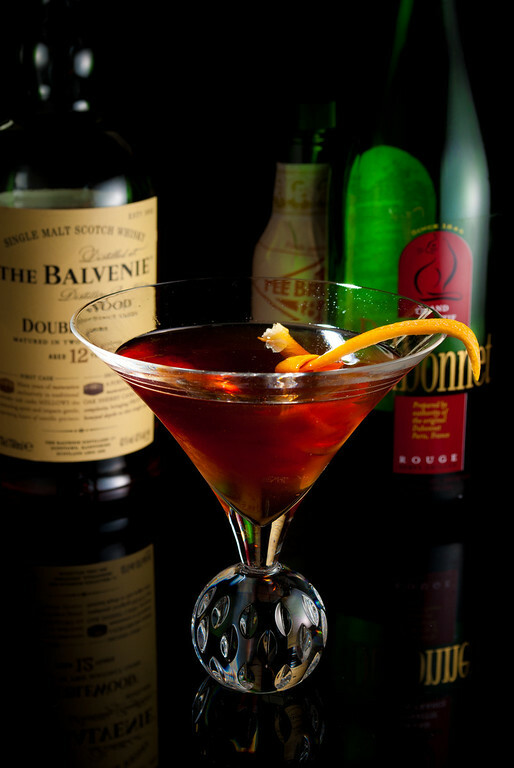 I found, however, that some Scotches are much more friendly to the Dubonnet and orange bitters, much more likely to blend into a flavor combination that presents a more textured, and for some a more accessible, set of flavors. Walker Black will give you the peaty, Scotch-forward, “alternative universe” version; a whisky like The Balvenie Doublewood provides an example of the more subdued personality. I haven’t worked out just what characteristics affect the flavor blend, but the Walker seems a little more medicinal to me, and perhaps a little salty; the Balvenie is more oaky, with sweeter vanilla and orange flavors familiar to dyed-in-wool bourbon drinkers like me. Perhaps it’s that seaside brininess that makes the difference. Whatever it is, the Balvenie incarnation of Arnaud’s Special is the first Scotch cocktail that has made its way into my regular cocktail rotation, and I am delighted. “Arnaud’s Special Cocktail” at cold-glass.com : All text and photos © 2010 Douglas M. Ford. All rights reserved. This is a definetly great cocktail. This is an excellent cocktail. Have you tried the “Phoebe Snow”? Similarly structured drink to this, but replace the Scotch with Cognac, and the bitters with a couple of dashes of Absinth. Yes, though for some reason, I’ve never written it up. (Note to self…) It hadn’t occurred to me that it has such a similar structure. It’s certailnly a dramatically different flavor profile. Thanks!